A “Black Lives Matter” billboard is up in downtown Fargo where an “All Lives Matter” billboard previously appeared. The new billboard is funded by dozens of contributions, including from Moorhead Mayor Del Rae Williams, to an online fundraiser organized by burlesque performer Anytime Jones. 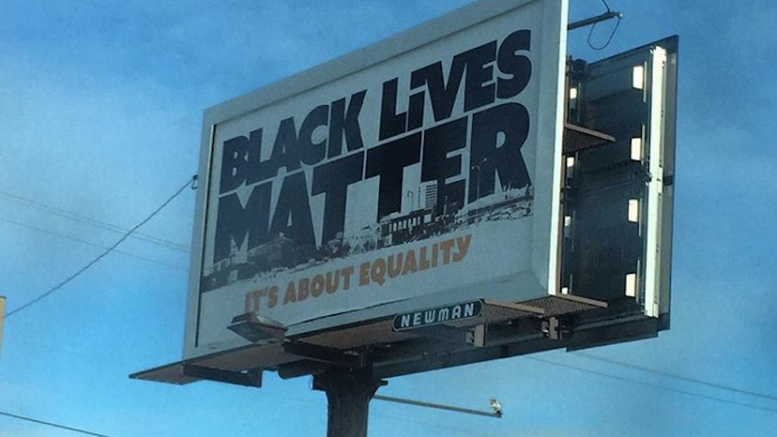 An “All Lives Matter” billboard popped up in downtown Fargo before the “Black Lives Matter” billboard. 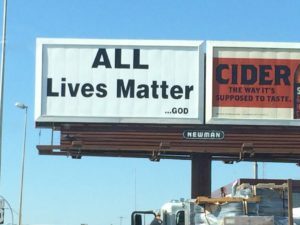 2 Comments on "“Black Lives Matter” Billboard Goes up in Fargo"
I lived in Fargo decades ago …. am amazed and pleased this is happening. Maybe there is hope. With so much racism and bigotry attached to the hate speak by the president elect and with the water Protectors at Standing Rock. I feel like America has reverted to 1963 Mississippi. I love the billboard. I really doubt my fellow North Dakotans do. I lost my connection with people. I have nothing in common with the people around me anymore. They elected Simon Legree president. I fear for the marginalized. it will not be good for them.